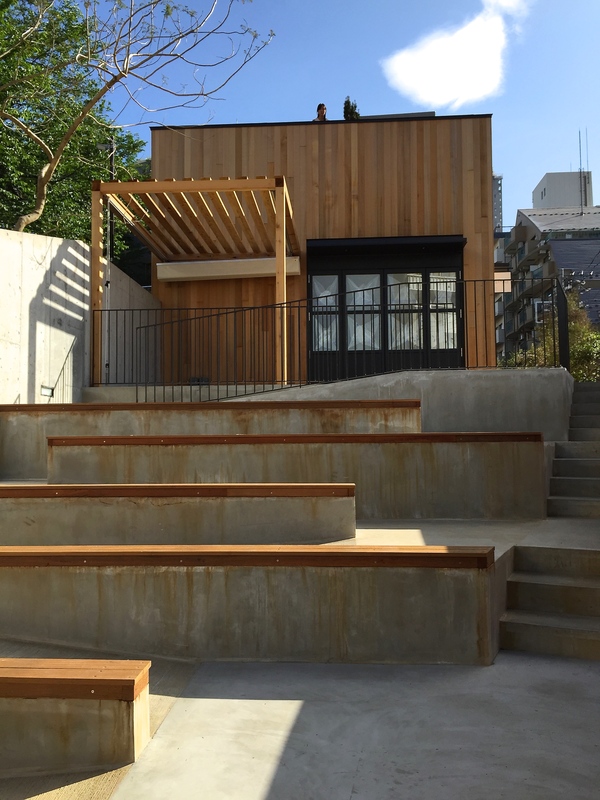 Log Road Daikanyama and Tartine Opening at End of May! 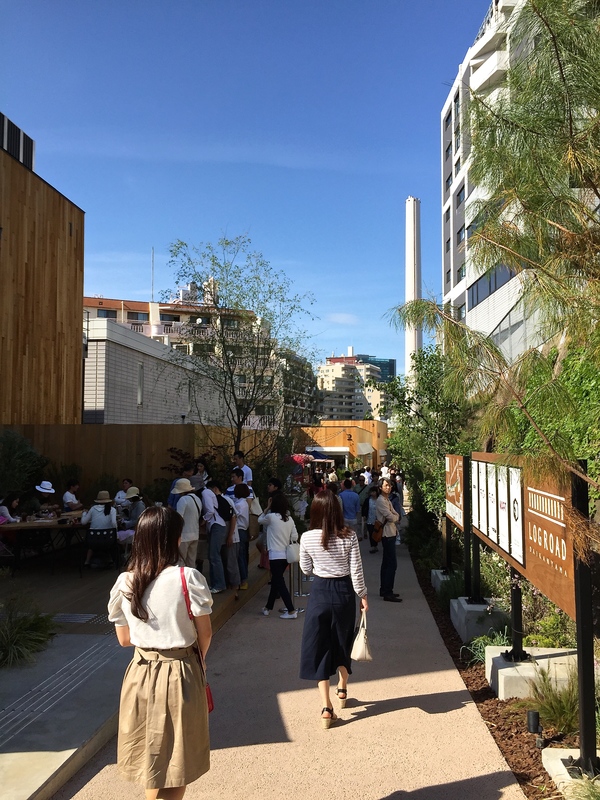 Just a short 5-minute walk north of Daikanyama Station is the new retail shopping development called Log Road. 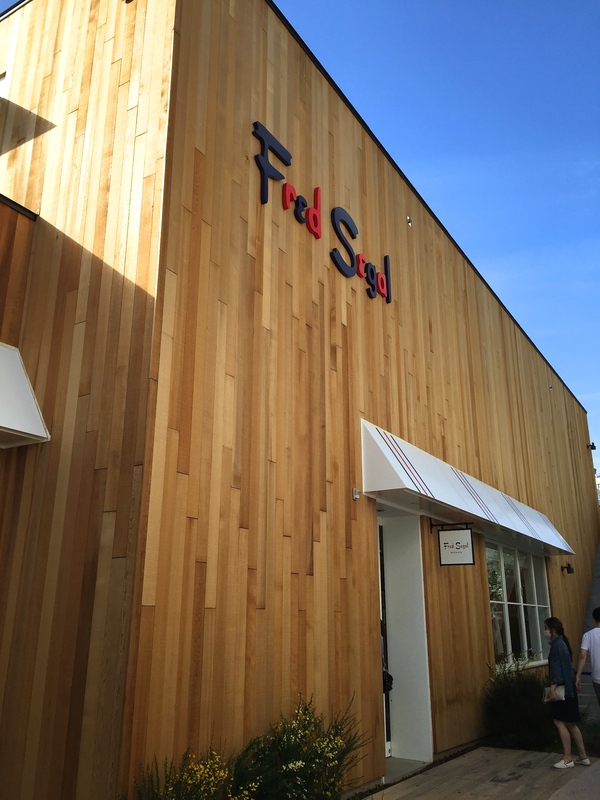 Just opened in mid-April of this year, it’s an oasis of hip import brands like L.A.-based Fred Segal and the first ever Japan branch of Tartine Bakery from the SF bay area. Other retailers include Spring Valley Brewery, a trendy brewpub where you can enjoy craft beers on tap with bar bites, and various food pop-ups. 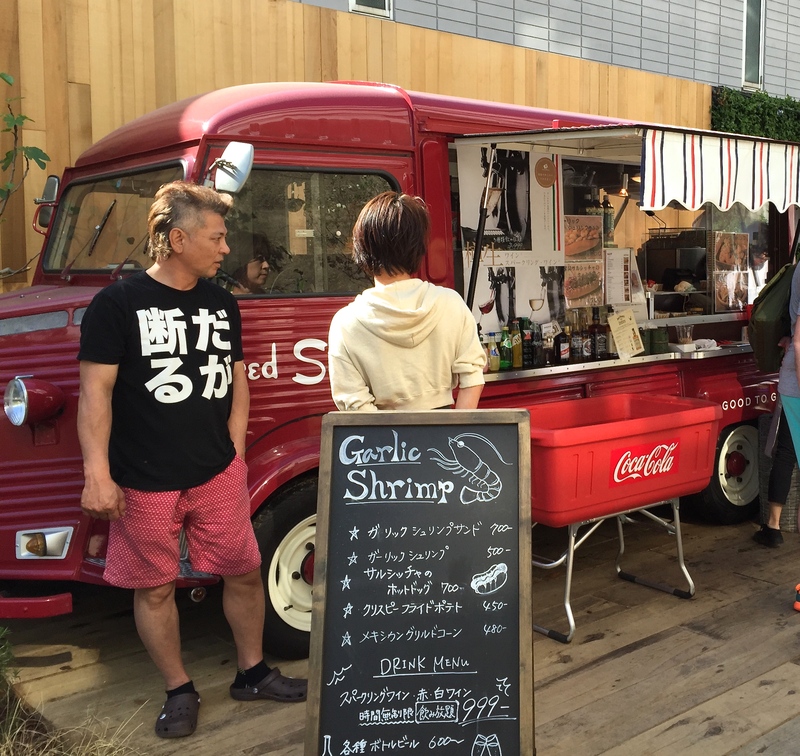 This past weekend, we saw a food truck associated with Fred Segal, called the Mart at Fred Segal, and a popsicle cart called Shonan Pops. The view from the south entrance. The Log Road is not literally a log-paved road. 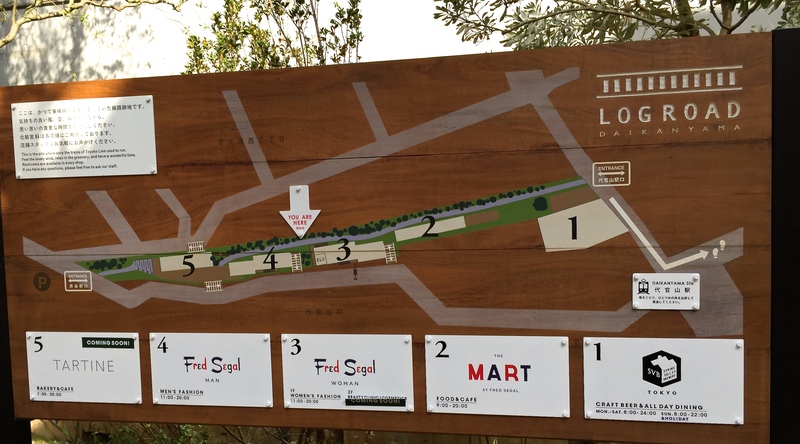 But it is a 220-meter path of planned retail experience, replete with wooden materials everywhere you look. (The architect also designed the Saturdays Surf NYC store space which utilizes a hell of a lot of blonde woods.) 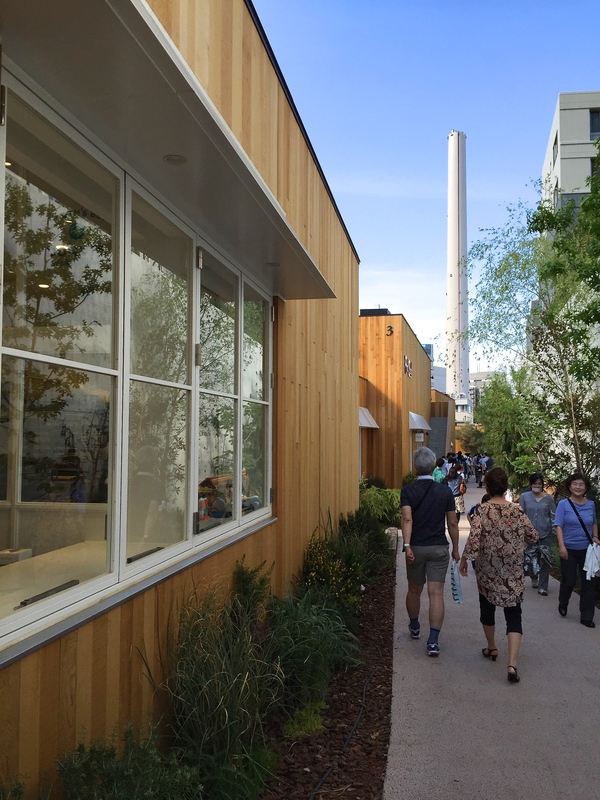 As you walk along the path, on one side are the store buildings, resembling large wooden shipping containers. On the other side of the path are benches for sitting and people-watching. 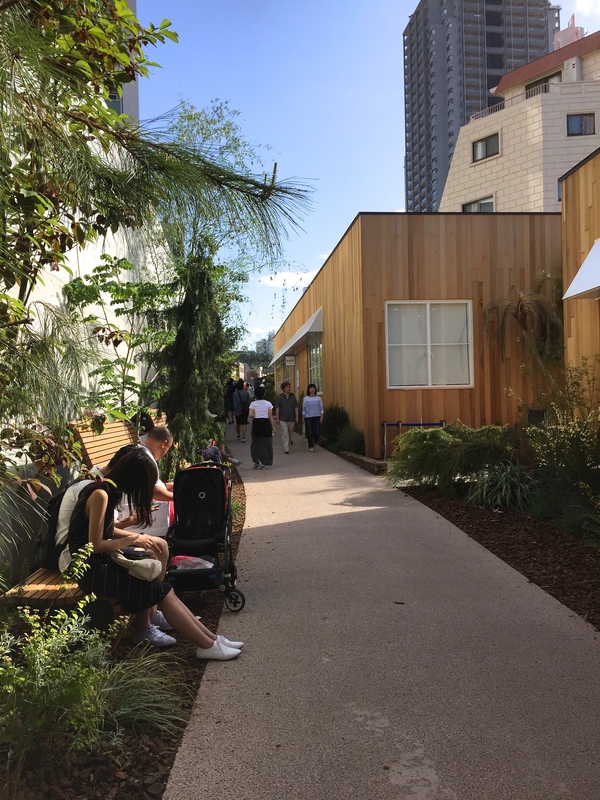 Due to the plethora of wood materials, and a good amount of landscaped greenery along both sides of the path, the area has the feel of an eco-friendly utopian compound. Fred Segal Women’s store. The Men’s store is next door. Nevertheless, when you dissect it, it really boils down to a very smart design. Consumers are drawn into the area from entrances on either end of the path, and then put onto a linear path of retail experience, without the choice to leave, because there are really no exits along the way. Like a conveyer belt, with flashy distracting ads. So, a consumer then, must walk by every store along the way, which increases the likelihood of stepping inside and buying things. Quite genius really. And from a consumer perspective, in doing this walk, I never felt bored or the need to leave due to the plethora of interesting things to look at and the abundance of communal spaces to sit and relax. The Fred Segal food truck serving up garlic shrimp sandwiches, hot dogs, and drinks. 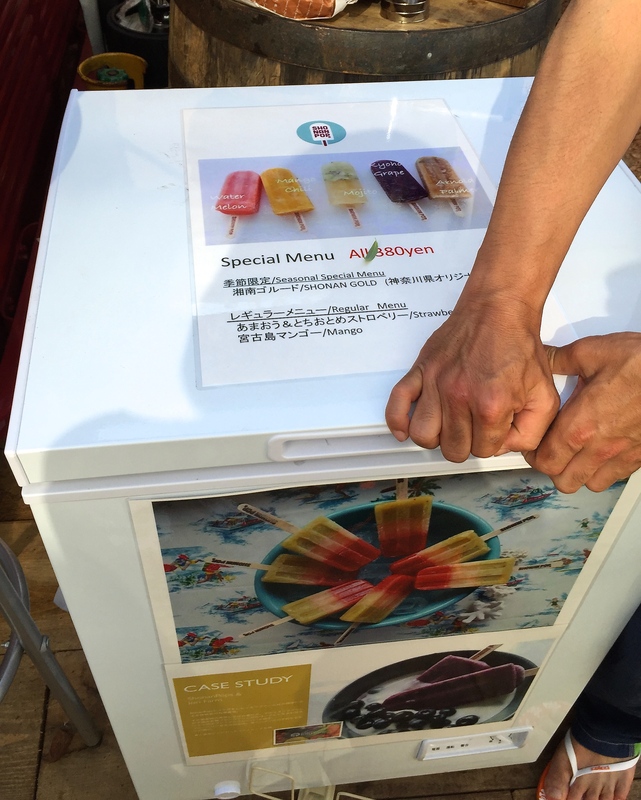 The Shonan Pops stand serving fruit popsicles for 380 Yen. 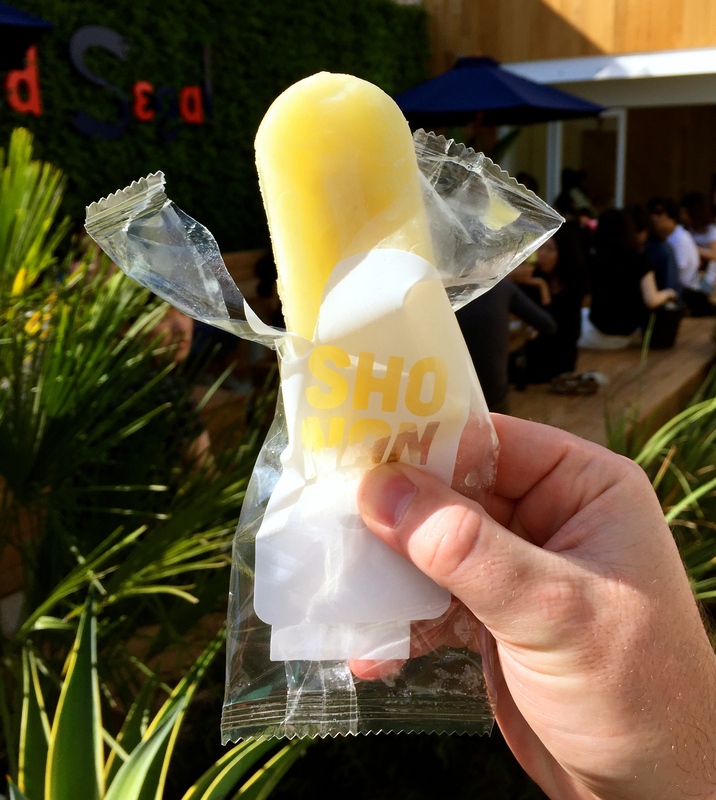 The Shonan Gold orange popsicle. Bright flavors! 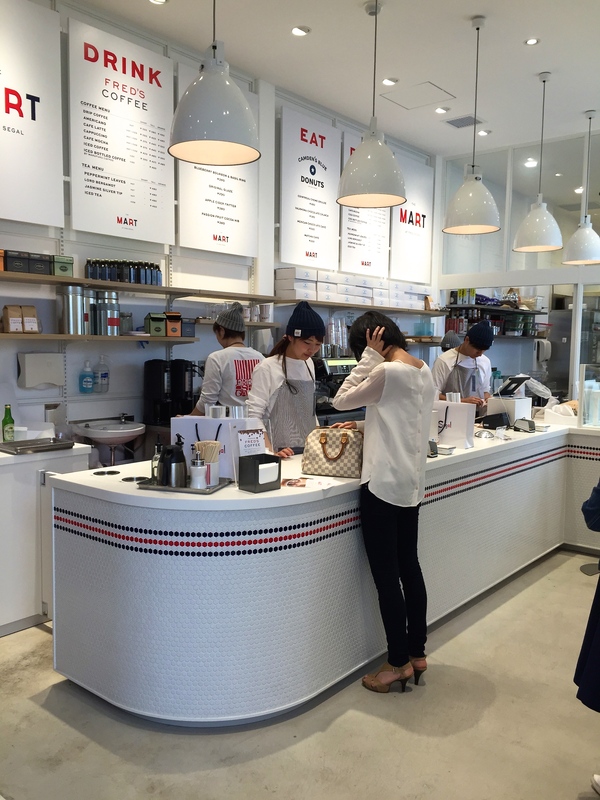 The Mart at Fred Segal sells housewares, foodstuffs, and also serves up coffee and donuts at its cafe. Donuts menu from Camden’s Blue Donuts. About 350 Yen ($2.95) a pop. On the north end of the Log Road will be where the Tartine Bakery and Cafe is. 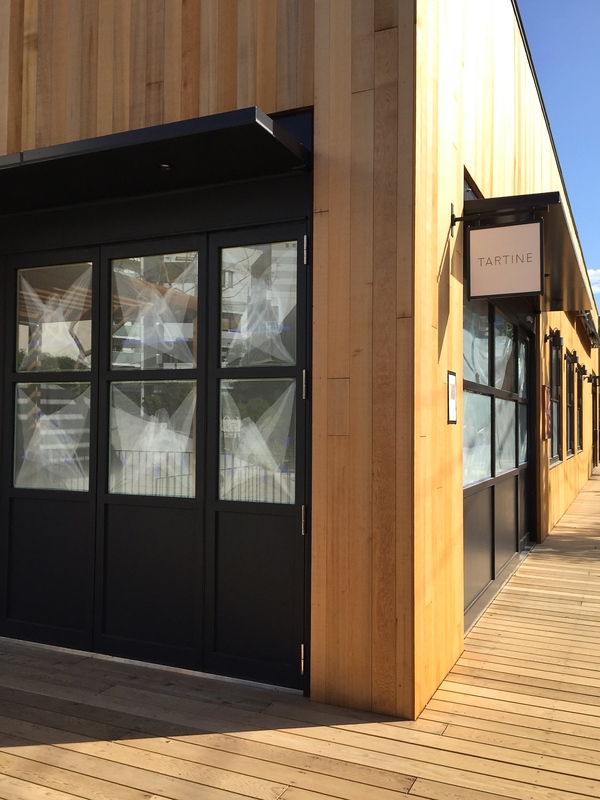 According to the Log Road website, Tartine will open later this month, with no concrete date set yet. No doubt there will be long lines the first few weeks it is open. Tartine is one of the top bakeries in SF, wildly popular with tourists, who line up around the block for fresh baked crusty breads, homemade desserts, and open-face tartine sandwiches. 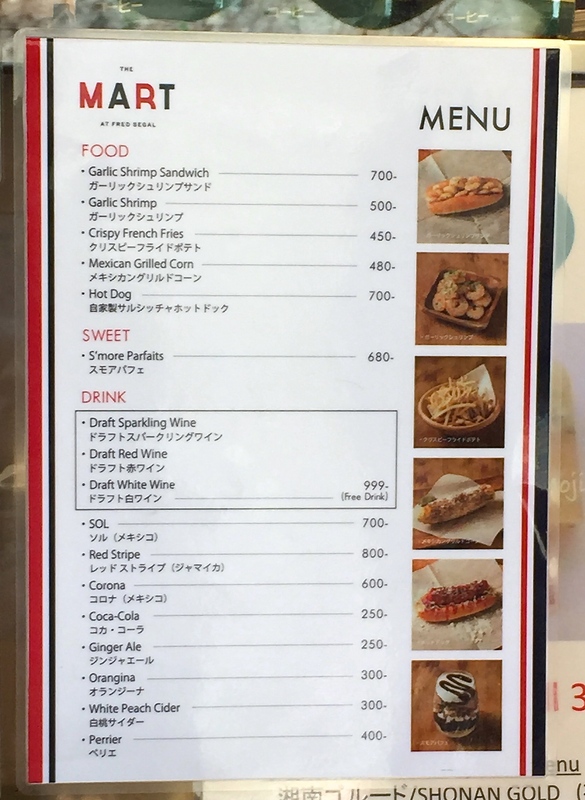 And besides, Tokyo-ites really love to queue up for novel food stuffs (e.g., Taco Bell, popcorn, pancakes, waffles, you name it), so this should be no different. Stadium style seating, in anticipation of the crowds? The Tartine space looked to be spacious inside, with a generous outdoor deck area, and additional bleacher-type seating in front, which was a bit strange. We are curious what the menu will include–the same SF favorites, new concoctions for Japanese palate, and/or any items from the Bar Tartine menu? 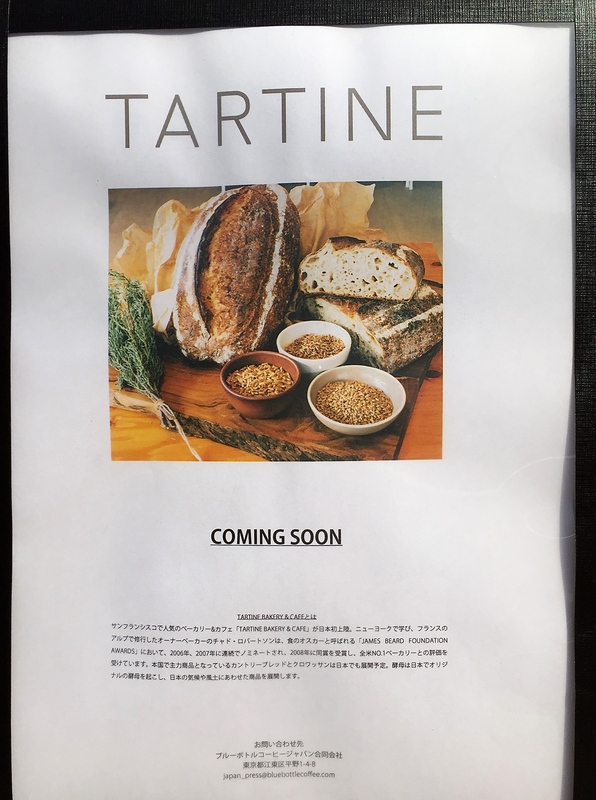 It’s also rumored that Tartine will serve Blue Bottle Coffee, another SF and Tokyo favorite. We shall wait and see, and I will be sure to report back when I find out any more news. This marks the south entrance to Log Road, which is where Spring Valley Brewery is located.